Status and trends: The July 2015 estimate was 2,259 ± 84 (Davison, T. pers. comm. 2016). The herd peaked at 19,300 (± 5,397 95% CI) in 1992, then declined to 11,089 ± 1,756 in 2000 and 1,821 ± 149 in 2006: a decline of about 85%. Subsequently, the trend between 2006 and 2012 was a slight increase to 2,427 and stable between 2012 and 2015 (Davison 2014). Ecology: Historic survey data of the 'Bluenose' herd indicated three separate calving areas. Genetic analysis and satellite collaring confirmed three herds with separate calving grounds and post-calving grounds - the Cape Bathurst, Bluenose-West and Bluenose-East herds. The Cape Bathurst herd calves and summers on the Cape Bathurst peninsula and winters below the treeline west toward Inuvik. The herd is primarily harvested by Inuvialuit and Gwich’in from Aklavik, Inuvik, Tsiigehtchic and Tuktoyaktuk. Forest fires are relatively rare on the winter range (Davison 2014). A cumulative effects analysis reported that 64% of caribou harvesting areas had environmental disturbance which were mostly thaw slumps or seismic lines (Tyson et al. 2016). 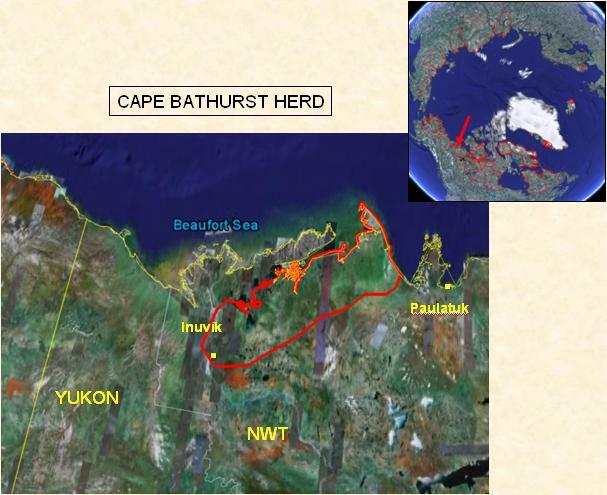 Additional to concerns about oil and gas exploration in the herd’s winter range are potential effects of a 140 km all-weather road connecting Tuktoyaktuk to Inuvik crosses the wintering range of the Cape Bathurst herd. The road has raised concerns about cumulative effects and possible changes in harvesting (EIRB 2013). Climate: The calving and summer range on the peninsula surrounded by sea-ice is relatively cool compared to more eastern herds and plant Growing Degree Days and the oestrid index are low. Summer precipitation is exceptionally low which elevates the drought index (extremes indices were in the late 1980s, 1990s and 2010 and 2012). Other severe and infrequent events are fall icing which in 2003 triggered unusual movements along the coast (Davison 2014). Significant trends (1989-2016) include reduced snow depths in early May, more plant Growing Degree Days in June, a declining mushroom index and warmer temperatures in October. Monitoring: In 1987, methods to estimate herd size changed to post-calving aggregation photography. Calf but not adult survival is monitored and mean late winter calf:cow ratios averaged 40.3 ± 4.35 SE from 2007-2013: in 2007 and 2013, the ratios low being <30 calves:100 cows (Davison 2014) but by 2016, the ratio was high (54.5 ±1.8 (SE) (GRRB 2016). As Inuvialuit, Gwich’in, and Sahtú land claims were settled, they undertook interview-based harvest studies. The three studies covered 1988 to 2001 and the average annual harvest totalled 5782 caribou but was not assigned by herd. Management: The mechanisms for the decline are uncertain especially given the lack of demographic information but the decline was possibly accelerated by interaction among harvesting, predation and climate. The herd’s annual range is within the jurisdiction of the Gwich'in Renewable Resource Board and the Inuvialuit Wildlife Management Advisory Council as well as the Government of the Northwest Territories. Non-aboriginal harvest limits were implemented in 2006, and then in 2007 the harvest was closed (Davison 2014). EIRB. 2013. FINAL REPORT of the Panel for the Substituted Environmental Impact Review of the Hamlet of Tuktoyaktuk, Town of Inuvik and GNWT -Proposal to Construct the Inuvik to Tuktoyaktuk Highway. Report of Environmental Impact Review Board, 292 pp. Davison, T. 2014. Technical Report on the Cape Bathurst, Bluenose-West, and Bluenose-East Barren-Ground Caribou Herds, a Companion Report to Taking Care of Caribou: The Cape Bathurst, Bluenose-West, and Bluenose-East Barren-Ground Caribou Herds Management Plan Report prepared the Advisory Committee for Cooperation on Wildlife Management. Inuvik, NT. 80 pp. Tyson, W., T. C Lantz and N. C. Ban. 2016. Cumulative effects of environmental change on culturally significant ecosystems in the Inuvialuit Settlement Region. Arctic 69: 391-405.